For many Egyptians it is the worst case scenario. Coming to work this morning my cab driver is seething: "They're as bad as each other, I won't be voting," he pledged, referring to the final runoff election between the two front-runners, due to take place in mid-June. He lamented the relatively slim-margin defeat of leftist candidate Hamdeen Sabbahi, "he got Cairo and Alexandria and, God bless the Prophet, Port Said." The as yet unofficial vote count of the first round has put the Muslim Brotherhood's Mohamed Morsi and the state-backed Ahmed Shafiq at the head of the pack, with nearly a quarter of the vote each. Sabbahi came third with a little over 20 per cent, with Islamist/liberal Abul-Fotouh trailing fairly closely behind, also within the 20 per cent range. As expected, no candidate was able to secure the 50 per cent-plus needed to win in the first round. The meteoric rise of Sabbahi to the position of a serious contender for the presidency has been the most surprising feature of a surprise-laden election. The final unofficial count gives Sabbahi 21.6 per cent of the vote compared to second-placed Shafiq, with 23.7 per cent. Moreover, Sabbahi easily won the nation's two great urban centres, Cairo and Alexandria. In Egypt's second capital, founded over two millennia ago by Alexander the Great, Sabbahi got a whopping 34.2 per cent of the vote, followed by Abdel-Moneim Abul-Fotouh at 22 per cent, with moderate candidate Amr Moussa running third at 16.5 per cent. Alexandria, long perceived as a major Muslim Brotherhood/Salafist hotbed gave the Brotherhood's Morsi a mere 15.3 per cent, placing him in fourth place. The spectacular Alexandria vote not only proclaimed it the nation's foremost revolutionary city (on Twitter, euphoric activists were sardonically calling for making Alexandria an independent republic), but also seemed to give rather solid credence to the anti-Brotherhood, anti-Salafist backlash, which political analysts no less than activists had noticed increasing during the past few months. In Cairo, Sabbahi again came first by a wide margin, winning 34.6 per cent of the vote, followed by Shafiq (25.9 per cent), Morsi (21.1 per cent) and finally Abul-Fotouh (19.2 per cent). I said so on TV on the first day of voting in the presidential election, only to receive a phone call from a friend who works in one of the organisations conducting these polls, congratulating me. Basically, he told me, the polls were wholly unreliable because the organisations had "no control over the sample." As it came out, the samples used by the various pollsters were provided by the government's statistics body, CAMPAS. One pollster, the Cabinet Decision Support Centre, was honest enough to reveal that some 21 per cent of their sample was drawn from the "very wealthy", and another 20-odd per cent from the "moderately wealthy" – which to put it mildly is rather unrepresentative of the general population in Egypt; maybe in Switzerland, commented our business editor, chuckling. For weeks the polls had consistently placed former Arab League secretary-general Moussa and liberal Islamist Abul-Fotouh well ahead of all the other candidates, which was the rationale behind their being picked for the televised debate, held jointly by a number of privately-owned Egyptian media organisations. Ultimately, the debate proved more a curse than a blessing, with the two presumably top candidates' under-performing, disappointing many among their potential supporters. One tweet at the time seemed to put it aptly: "In the debate between Moussa and Abul-Fotouh, the winner was Hamdeen Sabbahi." Yet, it was Morsi's standing in the opinion polls that gave them the lie. No one with a minimum understanding of current Egyptian reality could be so credulous as to believe that the Muslim Brotherhood, with its huge political and social network, and incomparable organisational experience and skill, could fail to garner for its candidate anything but the measly percentages the polls were coming up with. Nevertheless, if Morsi's rise to the forefront was predictable, the retreat of the two poll favourites, Moussa and Abul-Fotouh was indeed surprising. This was particularly stunning in Moussa's case. As Egypt's foreign minister (1991-2001) Moussa had been popular in his own right; associated as he had been in the minds of the Egyptian and Arab publics with a firm posture towards Israel, standing up for Egyptian and Arab dignity at a time when abject capitulation seemed the order of the day. It was Moussa who rained on the Oslo parade by bringing to the top of the Arab-Israeli peace agenda the issue of Israel's nuclear stockpile; it was Moussa as well who spoiled the Israel-Arab love-fest in the form of Middle East North Africa (MENA) economic integration meetings. He famously issued a call to Arabs to stop "scrambling" to normalise relations with Israel, earning him a popular, if rather vulgar song: "I love Amr Moussa, and hate Israel." It was this popularity, many believe, that convinced Mubarak the time had come to give Moussa "a kick upstairs", nominating him to general Arab acclaim as Arab League secretary general. There, Moussa furthermore became increasingly vocal in advocating political reform and democratisation in the Arab world. When the protesters occupied Tahrir Square during the 18-day Egyptian revolution, Moussa made a point of coming out of the Arab League headquarters at the south west edge of the square to express solidarity with the massed protesters and engage in dialogue with them. All of which seemed to make him the ideal centrist candidate. On the face of it, in Moussa the electorate had an experienced statesman, not lacking in charisma, famous for his perfect sound bites, moderately popular and largely free of the stigma of close involvement in Mubarak's corrupt and sycophantic clique. For a time, Moussa seemed the perfect choice to bring the country out of the quagmire in which the now fractured accommodation between the military and the Muslim Brotherhood had pushed it. Presumably, his proximity to the state would have enabled him to deal with a military that had become accustomed to ruling directly, while not being its creature, at the same time that his relative popularity and statesmanship would stand him in good stead in dealing with an Islamist-dominated parliament. It didn't wash. The revolutionaries insisted on describing Moussa as feloul, or a Mubarak regime "remnant", lumping him nonchalantly and unfairly with Shafiq. For his part, Moussa did not seem able to make up his mind as to which vote he was appealing to, and in trying to woo everyone he won over much fewer than he had hoped for, or indeed expected. As election-day was coming round, the "restoration of stability" vote, which Moussa had set out to win, was clearly leaning towards Shafiq. The word on that particular street was that Moussa was simply "too soft". Haute bourgeois voters, especially those within or with ties to the oligarchic crony capitalist network surrounding the Mubaraks and their clique, were joined by sections of the urban lumpenproletariat and impoverished peasants in seeking a "powerful" president – i.e. a dictator – who would crush the revolutionary rabble-rousers and bring the Muslim Brotherhood to heel. Ultimately, and despite Moussa's appeals to this constituency, they went over to Shafiq en masse. Meanwhile, these very appeals lost him considerable goodwill – not so much from amongst the bulk of the revolutionaries, who didn't support him to start with – but among what proved to be a substantial section of the electorate who supported the revolutionary ideals, hated the Mubarak regime, and dreaded to see Islamists taking over the executive power, after having won overwhelming dominance of the legislature. Many of these went over to Sabbahi. Further, it seems that at least a section of the Coptic Christian vote turned from Moussa, who had counted on it, to Shafiq. Since voting day, Egyptian Copts have been the object of virulent attacks from liberals and revolutionaries, who are putting Shafiq's win at the doors of the country's Christians, accusing them of having allegedly "betrayed" the revolution. It may be true that among certain Coptic circles the "too soft" label attached to Moussa seemed to have had considerable credence, not so much out of fear of the continuing instability blamed on the revolutionaries but of the Islamists, who appeared bent on seizing control of the whole country, wholly Islamising it, and even reviving the Islamic Caliphate. A military-backed Shafiq, some among the Coptic upper classes had been arguing, was sufficiently tough enough and strong enough to push back an Islamist takeover. How large a section of the country's Christian minority, estimated at over 10 million, actually went over to Shafiq is practically impossible to ascertain. However, the numbers certainly do not support the contention that Shafiq came in second place thanks to the "Coptic vote". In fact, the bulk of Shaifq's votes came from rural-dominated provinces, such as Menoufiya in the Delta, which is virtually free of Copts. And while it goes without saying that Abul-Fotouh, who was supported by many liberals and even leftists, did not garner many Coptic votes, there is little doubt that a great many Copts voted for Sabbahi. One glaring example has been Cairo's garbage collectors, the famedzabaleen, who were happy to tell anyone who cared to ask that they were solidly behind Sabbahi. To my mind, rushing to blame the Copts for the Shafiq vote is much more an indication of the perhaps tiny grains of bigotry that seem to lie just under the skin of a great many liberals, even leftist Egyptian Muslims. African Americans perhaps can easily recognise such a phenomenon, as much as European Muslims. The fundamental explanation for Shafiq's 23.7 per cent of the vote lies in the incontrovertible fact that the full machinery of the Egyptian state was most thoroughly and with remarkable efficiency mobilised behind him. The role that this machinery and network could play in even a rigging-free election was greatly underestimated. Parliamentary elections, which concluded last January, had defied predictions that the feloul, or remnants of the old regime, would grab at least a third of the parliamentary seats. Instead, the results seemed to indicate the ignoble collapse of the former ruling party's network and ability to mobilise the state machinery in its service. The presidential elections showed that this network was alive and well, and that, provided with intelligent planning and strong leadership from the masters of the state, represented by the military and intelligence bodies, the machinery of state and the network of political and business interests tied to it could be whipped into shape, to great effect. It should be pointed out here that Mubarak's ruling National Democratic Party was never a political party in any real sense of the word. Rather, it was a giant network of state patronage, in which the intermarriage of money and power, businessmen and bureaucrats at the very top is replicated down to the remotest hamlet in the country. Why this network, doubtlessly knocked down and bleeding at the revolution's hands, was so ably put to work in the presidential election, though it had seemed to collapse in the parliamentary elections a few months earlier, is open to a number of interpretations. There is of course the time element. The network needed time to heal, as well as a deliberate well organised effort to repair as much as possible of what was broken. Above all it required that the profound cleavages within the corpus of the Egyptian authoritarian state caused by the revolution should be reconciled. All of this needed time, political will and the deployment of highly proficient organisational capacity. This process of revival and repair of the ancien regime under the new conditions produced by the revolution had been going on, with fits and starts, since the ouster of Mubarak on 11 February. It is not farfetched, however, to presume that the collapse of the concord between the SCAF and the Muslim Brotherhood over the past few months was a major incentive to all parties of the Mubarak state and its patronage network to close ranks, follow orders and get the machinery linking the two running as smoothly as possible – ergo: Shafiq's second place. Only the above can explain a winning vote for a former regime figure, who was handpicked as prime minister by ousted president Mubarak in the last weeks of his reign, who in that capacity oversaw the infamous "Battle of the Camel", who is susceptible to a host of corruption charges, and whose public persona is that of a verbally challenged yet aggressive and vengeful tyrant in waiting. Yet Shafiq's 23 per cent is not a sterling result by any means, considering that that's the best that can be done by a decades-old authoritarian state, run by the military, the intelligence and security services and able to mobilise and put into motion a huge machinery made up of the state bureaucracy and repressive machinery, as well as the extensive network interlinking that machinery with local bosses and dignitaries spread across the nation including anything from tribal chieftains, village heads to billionaire industrialists and mangers of state economic enterprises. The paradox applies as well to the election's main winner and possibly Egypt's next president, the Brotherhood Mohamed Morsi. It is, in fact, the great paradox of Egypt's post-revolution presidential election, wherein a close look at the results reveals the two front-runners– of whom one will most likely become Egypt's president – as losers. This is obvious in the case of Shafiq – a throwback to a regime against which millions of Egyptians fought valiantly, giving over a thousand lives, and thousands more in lost eyes and limbs to bring down, does not make for a promising political career. His 23 per cent, as pointed out above, reflect the optimum capacity of that revolution battered authoritarian regime; it's all downhill from here in on. Short, that is, of a Pinochet-style coup d'état, in which thousands are killed, detained and disappeared. A highly unlikely event. The paradox may not be as stark in the case of the Muslim Brotherhood's Morsi, but is no less true for that. Here again we have a huge, experienced, well-oiled and lavishly-financed machine being fully mobilised and most expertly deployed. The Brotherhood, moreover, oversees its own huge patronage network, made up not only of charities and thousands of mosque-attached basic services, including health and education, but also extensive businesses which give employment to tens of thousands across the country. Such a network could only be massively bolstered by the Brotherhood's parliamentary triumph, which gave it 47 per cent of the People's Assembly seats (235). Patronage, it might be noted, has been the fundamental, one is tempted to say only, function of the Egyptian parliament for decades. Presumably, the new post-revolution parliament would eventually come to perform more of the political functions that legislatures are supposed to do, yet for a great section of the public no less than for a great many of their deputies, patronage remains paramount; an MP is expected to use his access to the state to deliver state favours to his constituents, whether individually or in groups, to each according to his means, to rephrase a famous axiom. The performance of the Muslim Brotherhood in parliament, its failings no less than the constraints it has been working under, is the subject of another enquiry. What I'm drawing attention to here is that the Brotherhood's overwhelming presence in parliament should have given a substantial boost to the group's presidential campaign. This is especially true, since the Brothers and their Salafist on-off allies decided to suspend parliamentary sessions in order to allow MPs to go back to their constituencies to campaign for their presidential candidate. So despite what the polls were saying, everything seemed to be going for the Brotherhood, and certainly, their candidate came in first place. Yet, let's stop awhile here. The Brotherhood's, or Freedom and Justice Party's Morsi got a little over five million votes; the group had garnered somewhere around 10 million votes in parliamentary elections a mere few months before. Even while conceding that the difference in voting patterns between parliamentary and presidential elections may account for some decline in voter support, a 50 per cent drop in a mere 3 or 4 months is simply too staggering to explain away. This is supported by the evidence of our own eyes and ears. I was stunned during the past weeks by the level of hostility to the Brotherhood that one seemed to encounter everywhere he went, so much so that I began to get the sense of an anti-Muslim Brotherhood anti-Salafist backlash. This was born out by the numbers, which saw Sabbahi well ahead in almost all major urban centres in the country, including its first and second capitals, Cairo and Alexandria, and the city that gave brith to the Egyptian revolution, Suez. Take also such cases as that of the densely populated and horribly destitute Cairo district of Imbaba. During the 90s of the last century, Imbaba had come under the sway of the militant Al-Gamaa Al-Islamiya to such an extent that it was widely named the Islamic Republic of Imbaba. When the police finally, and with predictably tremendous viciousness, crushed the Gamaa by the end of that decade, it was natural for the district to be inherited by the Brotherhood. Imbaba results in the first round of the post-revolution presidential elections in 2012 had Sabbahi in first place (32.2 per cent) followed by: Shafiq (23.2 per cent); Morsi (18.3 per cent); Abul-Fotouh (14.7 per cent). All of which seems to support that not only was the Muslim Brotherhood's support waning, but that in fact there was something of a backlash against the group. Which seems to explain yet another surprising result of this election. Abul-Fotouh, who the polls had running neck and neck for first place with Moussa, dropped to fourth place in the actual results, following Sabbahi who came third. As it happens, Abul-Fotouh seems to have been tarred with the same brush as Moussa, his TV debate counterpart. Here too we have a case of a candidate trying to appeal to everyone, losing him the trust of many. Even before his expulsion from the Muslim Brotherhood, Abul-Fotouh had associated himself with the revolution and its ideals from the very beginning. Under his presidential campaign banner, he was able to gather a kind of "rainbow coalition", made up of Islamists, liberals and even leftists. Yet just as Moussa tried to appeal to both the revolutionary and counter-revolutionary constituencies, Abul-Fotouh spoke to liberals and democrats from one side of his mouth, and to Salafists and conservative Islamists from the other. In his televised debate with Moussa he kept repeating that he stood not for the application of the "principles" of sharia, as Moussa was suggesting, but its "totality", whatever that means. It was also announced, following meetings between him and Salafist leaders, that the latter would support Abul-Fotouh. All of which seemed to impeach the pro-revolutionary Islamist's democratic and liberal credentials, pushing many of his initial supporters to jump ship, going over to the Sabbahi camp, and scaring away many more undecided. In much of urban Egypt the word on the street was "we want neither feloul (Mubarak regime remnants) nor Muslim Brothers"; you came up against it everywhere. It was that for a great many Egyptians – some 40 per cent of the electorate – their worst nightmare became reality. Having stunned themselves and the world by staging a great revolution, at enormous sacrifice, many Egyptians felt there were back in square one, the very square which their despised deposed president used to taunt them for 30 years: "it's me or the Muslim Brotherhood." Yet, and this for the first time in our history, we can with a fair degree of confidence say that while a quarter of us want the Brotherhood and another quarter want restoration, nearly half of us want the revolution realised; not at all a bad place from which to start putting that revolutionary house in order. "Minerva's owl flies at dusk." The metaphor was used by Hegel in the preface to his Philosophy of Right to underline his argument that a stage of human history can only be understood in retrospect, as that stage was in its twilight. I have used it in the title of this piece in a somewhat different sense. The electoral triumph of the Mubarak regime on one hand and that of its no less authoritarian historical antagonist, the Brotherhood, on the other, heralds not their ascent but their decline. It is not a new dawn of the Muslim Brotherhood that we are witnessing, nor is it a revival of the semi-secular police state à la Mubarak, Gaddafi et al, but rather the twilight of both. Article pretty spot on but may miss two fundamental keypoints. As an analytical article, Minerva's owl flies at dusk is generally excellent. It far surpasses anything I've read on the web, including articles by NY Times, IHT, CSM. However, it misses two fundamental points, if what I hear from many I've spoken with: Amr Moussa was quite popular but many rumours were circulating that he drinks too much alcohol. Secondly, supporters of Morsi were known to be spreading threats of revenge is Morsi lost and claimed they would know who did and who did not vote for him. Thus, it would appear there was plenty of motive for the two diametrically opposed finishing 1st and 2nd. Democracy often takes such turns. Particularly when anarchy is thought to be knocking at the door. 2012 is proving to be a case of damned if you do, damned if you don't. 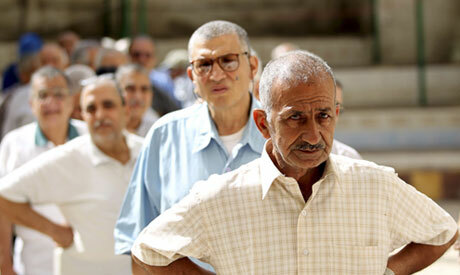 Is there a third alternative Egyptians can embrace? Amr Moussa tried to convince Egyptians that their biggest concern is Israel. Same with a few others. Give them credit, but your own voters decided that the economy and stability were more important than a tiny neighbor. Keep focusing your anger on the Jews. That will definitely bring back the tourists. Elections are not won on hate? What planet do you live on? In most times, in most democracies, politicians have learned the value of hate, fear, jealousy are far more powerful than love and kindness. I wish you were correct, but, sadly report that in no nation have your ideals yet proven true. i will take this rather lengthy but unsubstantiated article with a pinch of salt. so far...all their predictions went wrong. they have no credible. It seems most of your reporters, taxi drivers, and interviewees are decidedly leftist. Your opinion polls are pro-left, your ultimate villains are the Islamists. I think you are venting your own frustration and failures by concocting tendentious reports that don't reflect reality. But the Islamists won't just disappear just because you hate them. I think you will have to get yourselves accustomed to see them in government. I disagree with you Jane. True, their is a touch of misplaced advocacy and opinion, but these writers do a pretty fair job and should be appreciated. Anderson Cooper and Ben Wedeman also inject their opinions, but are reasonable objective. Gone are the days of truly objective (Bernard Shaw, Walter Cronkite) objectivity though. "Urban lumpenproletariat"? Yeah, this "revolution" really connects with the Egyptian people.